Impressionism and Plein-Air Landscape Painting. (1897) North Carolina Museum of Art. In many ways, Impressionism marked the beginning of modern fine art painting, especially landscape painting. In seeking to faithfully reproduce what they saw, Impressionist painters inadvertently undermined the Naturalist tradition established by the Renaissance. Put simply, Impressionism captured fleeting moments. If at these precise moments, a tree (or pond) appeared pink, due to the light of the sun or the reflection of flowers, then the artist coloured the tree (or pond water) pink. Naturalist colour schemes did not allow for this intense inspection of nature, or how it was affected by light. As a result Impressionism opened up a whole new pictorial language, and in so doing paved the way for Picasso's reinterpretation of reality - which in turn dramatically expanded our concepts of fine art. Note: To see the roles that landscape and Impressionist painting played in the evolution of 19th century art, see: Realism to Impressionism (1830-1900). of all the French Impressionists. The leading member of the French Impressionist School, its most prolific landscape artist, and the most ardent advocate of 'pure' Impressionism - meaning 'paint exactly what you see, without trying to interpret it' - was Claude Monet (1840-1926). It was his painting Impression, Sunrise (1872) which in 1874 gave its name to the movement, and his later works - such as the 'Series' paintings of railway stations - see Gare Sainte-Lazare (1877) - haystacks and water lilies, where he painted the same subject dozens, if not hundreds of times - reflect his lifelong fascination with the portrayal of light. For his lily paintings, see for instance: Water Lilies (Nymphéas) (1897-1926, various art museums); and The Water Lily Pond: Green Harmony (1899, Musee d'Orsay, Paris). For other plein-air landscapes, see: La Grenouillere (1869, Metropolitan Museum, NY); The Beach at Trouville (1870, Wadsworth Atheneum); and Poppy Field (Argenteuil) (1873, Musee d'Orsay). 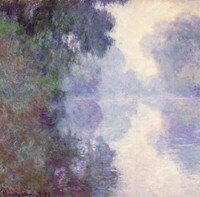 Like other Impressionists, he was also an avid student of natural effects such as snow and mists. (Note: For an explanation of 19th century landscapes by Impressionist painters, see: Analysis of Modern Paintings 1800-2000). Derived from the plein air painting traditions of the Barbizon school of landscape painting, Impressionism in France encompassed many famous painters and many individual styles, and its paintings ranged across all genres, from landscape and still life to portraiture and genre scenes. Its treatment of landscape however, was central to its existence, and reflects its unique contribution to the history of Western art. 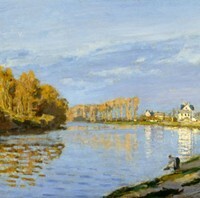 Among its principal exponents who painted landscapes were Camille Pissarro (1830-1903), Pierre-Auguste Renoir (1841-1919), and Alfred Sisley (1839-1899). For a list, see: Modern Artists. Always argumentative and always broke, Pissarro participated in all the Impressionist Exhibitions and his subjects consisted of mainly rural and urban landscapes. 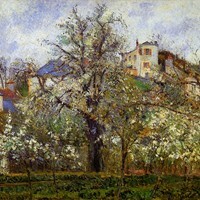 His landscapes include: The Red Roofs (1877) and Vegetable Garden with Trees in Blossom, Spring, Pontoise (1877). Renoir was the greatest ever painter of dappled light, who later turned exclusively to nudes. His works include: Path Leading Through Tall Grass (1877). Alfred Sisley, the 'forgotten Impressionist' and the most underrated, was especially adept at composition, introducing interesting lines and angles into his landscapes, and produced exceptional colour combinations. 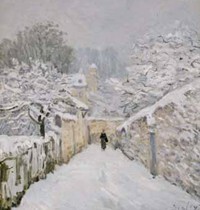 His works include: Canal St Martin (1870), Chemin de la Machine, Louveciennes (1873), Misty Morning (1874), Snow at Louveciennes (1878). These and later Impressionist paintings are among the most famous landscapes yet produced. Note: For details of French style plein-air painters from Ireland, see Irish Landscape Artists and Plein-Air Painting in Ireland. By the 1880s, the Impressionist movement was beginning to divide into two basic groups: those - like Monet - who continued to pursue the study of light with scientific zeal, and those - called Post-Impressionists - like Georges Seurat (1859-1891), Paul Cezanne (1839-1906), Vincent Van Gogh (1853-1890) and others who were becoming dissatisfied with what they considered to be the 'passive' nature of Impressionism, and were more interested in interpretation. As a result they focused greater attention on matters of pictorial organisation, structure, composition and colour. Cezanne began as an Impressionist with works like The House of the Hanged Man (1873), and ended with more structured landscapes like his series of Mont Sainte-Victoire paintings (1882-1906). Georges Seurat, the originator of Pointillism and Divionism, organized his landscapes along classical principles to convey quiet grandeur. His urban landscapes include: A Sunday Afternoon on the Island of La Grange Jatte (1884). Paul Cezanne - a workaholic and a huge influence on Matisse and Picasso - adapted Impressionism into a means of slow acutely observant painting of familiar scenery, using grid-like structures in an attempt to pursue French Classical painting traditions from outdoors. His landscapes include: Montagne Sainte-Victoire with Trees and a House; La Montagne Sainte-Victoire (1904-6). Vincent Van Gogh, the melancholic but prolific Expressionist landscape artist, whose every painting is autobiographical, distorted form and colour to express his inner feelings rather than simply record his observations. His landscapes include: Cherry Tree (1888); The Old Mill (1888); The Harvest, Arles (1888); Bridge at Arles (1888); View of Arles with Irises (1888); Cypresses (1889); Cornfield with Cypresses (1889); View of Arles (Flowering Orchards) (1889); The Olive Trees (1889); Starry Night (1889); The Olive Pickers (1889); Wheat Field with Crows (1890); Starry Night (1889). During the late 1880s and 1890s, the city of Melbourne witnessed the first appearance of the Heidelberg School of Australian Impressionism, dedicated to plein-air landscape painting. Led by Tom Roberts (1856-1931), its important members included Arthur Streeton (1867-1943), Fred McCubbin (1855-1917) and Charles Conder (1868-1909). Nineteenth century landscape painting in America witnessed the emergence of several outstanding schools. These included: the Hudson River School (c.1825-75), the Luminism movement, Tonalism personnified by Whistler (1834-1903), and American Impressionism (c.1880-1900). The Impressionist movement in the United States was dominated by the painting of William Merritt Chase (1849-1916), Theodore Robinson (1852-96), J. Alden Weir (1852-1919), John H Twachtman (1853-1902) and Childe Hassam (1859-1935).  For more about portraits, landscapes, still-lifes etc., see: Painting Genres.  For more about the evolution of Impressionism, see: History of Art Timeline.  For more about Impressionist-style landscape painting, see: Homepage.